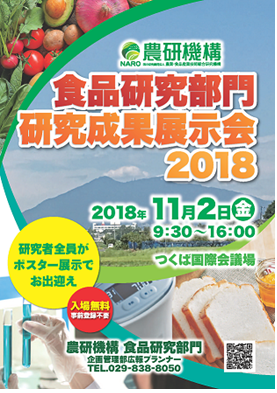 The Food Research Institute, NARO (NFRI) is organizing an exhibition featuring its research and technological achievements. The NFRI conducts a wide range of basic and applied research on food and agricultural products, including analysis of food and potential health benefits, securing food safety, and developing innovative distribution and processing technologies etc. In this exhibition, the researchers in charge of various research programs will explain their latest research achievements and other information in poster presentations, and respond to questions, inquiries and consultations related to their research. This exhibition will also serve as a venue for exchanging ideas and interacting with the researchers from NFRI. Hopefully, the researchers and R&D staff from companies or local governments engaged in the food-related industry will avail this opportunity to strengthen their collaborations, promote their collaborative researches and develop new business opportunities. R&D managers of companies and organizations involved in food-related industries, Public institution and university, Researchers of independent administrative agencies, Representatives of R&D policies of national and local governments, etc. Pre-registration not required. No participation fee.